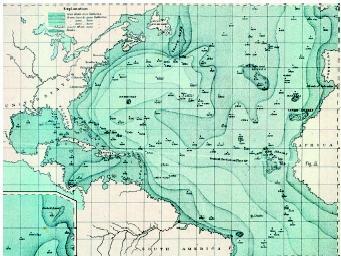 Bathymetric mapping involves the production of ocean and sea maps based upon bathymetric data (see historic map). Bathymetric maps represent the ocean depth as a function of geographical coordinates in the same way topographic maps represent the altitude of Earth's surface at different geographic points. The most popular type of bathymetric maps are ones on which lines of equal depths (called isobaths) are represented. For hundreds of years, the only way to measure ocean depth was the sounding line, a weighted rope or wire that was lowered overboard until it touched the ocean floor. Not only was this method time-consuming, it was inaccurate; ship drift or water currents could drag the line off at an angle, which would exaggerate the depth reading. It was also difficult to tell when the sounding line had actually touched bottom. England's Sir John Murray compiled this bathymetric (depth) chart of the North Atlantic in 1911. Murray's chart went far beyond American naval officer Matthew Maury's first attempt at bathymetric mapping in 1855. In addition, Murray's map gave birth to the idea of the Telegraphic Plateau, a submarine land formation from Canada to the British Isles, across which the first transatlantic cable was laid. In the twentieth century, sounding lines were entirely replaced by sonar systems. Sonar ( so und na vigation r anging), invented during World War II (1939–1945) measures distances by emitting a short pulse of high-frequency sound and measuring the time until an echo is heard. After the war, ships with sonar units attached to their hulls crisscrossed the world's oceans systematically, measuring depth. The data collected made possible complete bathymetric maps of the world's oceans. For the first time, scientists knew what 70 percent of Earth's surface really looked like (radar, which produces images by bouncing radio waves rather than sound waves off distant objects, cannot be used for bathymetry because water absorbs radio waves). Many sonar techniques have been developed for bathymetry. When high-resolution images are desired, an underwater unit may be towed behind a ship, scanning to the left and right with multiple sonar beams (sidescan sonar). * Furthermore, orbiting visible-light cameras image the bottoms of some shallow waters, while satellite radar maps deep-sea topography by detecting the subtle variations in sea level caused by the gravitational pull of undersea mountains, ridges, and other masses. The oceans begins, of course, at the shore, the irregular boundary where the surface of a continent descends first to sea level and then beneath it. If the depth of the ocean is measured along a line drawn straight out from a continental shore, the following sequence of bottom features are typically seen. For many miles out, the ocean is only a few hundred feet deep and gets deeper quite slowly (i.e., slopes at an angle of 0.1°, or 1.7 meters per kilometer [9 feet per mile]). This flat, wide margin is found around every continent and is known as the continental shelf. The average width of a continental shelf is 70 kilometers (43 miles). The continental shelf ends at a sudden dropoff called the shelf break. 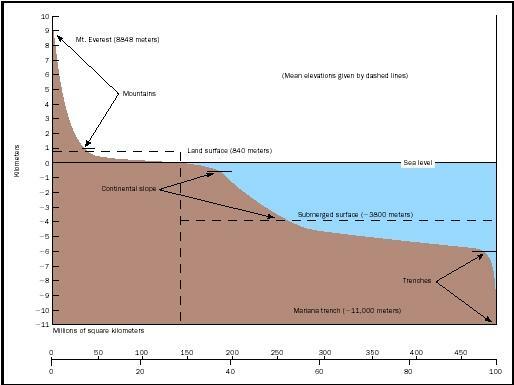 Beyond the shelf break, the slope of the ocean floor becomes much steeper, typically a 4° slope, or 70 meters per kilometer (370 feet per mile). This steep embankment is called the continental slope and is grooved by submarine canyons and gullies. The continental slope is about 16 kilometers (10 miles) wide, on average, and descends to a depth of about 2.4 kilometers (1.5 miles). There it ends as the slope moderates to a mere degree or two from horizontal. This gradual zone, which may be several hundred miles wide, is called the continental rise. It is composed of fine-grained continental sediments (silt and clay) washed down the many submarine canyons that notch the continental slope. The abyssal plain, which is the deepest, most level part of the ocean, is found where the continental rise ends, at a depth of about 4 kilometers (2.5 miles). The abyssal plain is dotted with thousands of small, extinct volcanoes called abyssal hills. The abyssal plains of the Atlantic appear smooth because its abyssal hills are buried under a thick blanket of continental sediment, but in the Pacific Ocean basin, which is ringed by trenches that trap sediments before they can spread over the ocean floor, tens of thousands of unburied abyssal hills have been observed. Abyssal hills more than 1 kilometer (0.6 mile) high are called seamounts, and seamounts with flat tops are called guyots or tablemounts. Guyots are drowned volcanic islands that become submerged due to subsidence of the oceanic lithosphere . Beyond the abyssal plain, which may be several hundred kilometers wide, the ocean floor begins to ascend again with a gentle slope. This area is the flank of the mid-ocean ridge, a long, undersea mountain chain that usually extends down the middle of the ocean. The Mid-Atlantic Ridge, for example, snakes down the middle of the Atlantic most of the way from the North Pole to Antarctica. * As the ocean floor climbs slowly toward the center of the mid-ocean ridge its sediment blanket gets thinner and its surface more irregular. Here, the ocean floor is marked by thousand-mile cracks called fracture zones that lie at right angles across the mid-ocean ridge. Along the center of the mid-ocean ridge is the rift valley, a deep V-shaped notch. From this valley, new oceanic crust is constantly being extruded from Earth's mantle by processes not yet fully understood. Twin sheets of fresh, mile-thick crust emerge from the mantle along the sides of the rift valley and flow slowly away from it in opposite directions. In the case of the Mid-Atlantic rift valley, one sheet flows east and the other west, each moving at about half an inch per year. The older, more distant parts of these growing sheets of crust are gradually covered by sediments, eventually becoming the abyssal plains and continental rises described above. These growing sheets of crust have the effect of forcing the distant continents farther apart, a process called sea-floor spreading. Beyond the rift valley, the depth sequence described above is observed in reverse: a gently declining slope of ridges and fractures, an abyssal plain, a continental rise, a steep continental slope, a somewhat flat continental shelf, and finally dry land again. This would be the case in crossing the Atlantic Ocean. Elsewhere, however, such neat symmetry is not always found. Some continental margins are characterized by subduction zones, whereby oceanic crust is destroyed beneath the edge of a continental plate. The hypsographic curve shows the amount of Earth's surface at various elevations and depths. Horizontal dashed lines indicate average height of the continents at 840 meters (2,750 feet) above sea level, and average depth of the oceans at 3,800 meters (12,460 feet) below sea level. The vertical dashed line marks the division between land and sea at present-day sea level. The disappearance of oceanic crust into subduction zones is occurring primarily along the western, northern, and eastern edges of the Pacific Ocean. These subduction zones are the deepest places in the ocean, varying from 7 to 11 kilometers (4 miles to 6.8 miles) in depth. Along the length of a typical subduction zone or deep-sea trench, a sheet of old oceanic crust is forced beneath continental crust. The oceanic crust that is forced to submerge or subduct in this manner slides down into the mantle at an angle. The elevation features of the ocean floor—shelves, slopes, rises, plains, ridges, and trenches—are quantitatively summarized by oceanographers, along with the distribution of dry land at different altitudes, in a graph called the hypsographic curve (see the figure). The hypsographic curve shows what percentage of Earth's surface rises above present-day sea level to a given height, or sinks below it to a given depth. The curve shows that a small percentage of Earth's surface consists of high-altitude continental mountains, 30 percent of the surface consists of continental lowlands. Continental shelves and slopes account for about another 15 percent, abyssal plains and mid-ocean ridge systems for almost 50 percent, and deep-sea trenches account for a small fraction. The fact that Earth's surface is comprised mostly of flat plates of continental and oceanic crust, with mountains and deep-sea trenches occurring only along their edges where the plates collide, gives the hypsographic curve its characteristic shape. SEE ALSO Geospatial Technologies ; Marginal Seas ; Mid-Ocean Ridges ; Oceanography from Space ; Plate Tectonics ; Sound Transmission in the Ocean ; Volcanoes, Submarine . Medwin, Herman, and Clarence Clay. Fundamentals of Acoustical Oceanography. New York: Academic Press, 1998. Neumann, Gerhard, and Willard Pierson. Principles of Physical Oceanography. Englewood Cliffs, NJ: Prentice Hall, 1966. Sabins, Floyd. Remote Sensing: Principles and Interpretation, 2nd ed. New York: W. H. Freeman and Company, 1987. Thurman, Harold, and Elizabeth Burton. Introductory Oceanography, 9th ed. Upper Saddle River, NJ: Prentice Hall, 2001. * See "Plate Tectonics" for an illustration showing types of plate convergence. * See "Mid-Ocean Ridges" for an image showing the Mid-Atlantic Ridge and other extensions of the ridge system. * See "Sound Transmission in the Ocean" for a photograph of a modern sonar device. what is the cheapest way in determining ocean floor?how is it accurate? What percent of the earth's surface is "deep" ocean and how deep is "deep" ocean considered?